Scott will open your eyes to a different way of doing work that matters. His generous, persistent, consistent belief in our ability to level up and contribute comes through. This is time well spent. This is a handbook about where the art of living and the creative process collide. Are you missing the bullseye with your work? Find it by applying ancient wisdom to your creative capacity. Are you fully realizing your excellence? TSC can help you aim and fire in the right direction with greater precision. Develop your potential while you deliver work that matters to those that need it. The Stoic Creative shares concepts and tools that help engage your curiosity, courage, and creativity to do more work that matters. Work done on purpose, with purpose, and for a purpose enhances the lives of everyone it touches. Share your excellence. We need you! What happens when you are a professional who is creative on purpose? You identify the unique gift that only you can share by aligning your core values with your true talents. You collaborate and serve those who share your values and need your talents to enhance their lives. You experience greater prosperity, passion, recognition, and significance through your work. 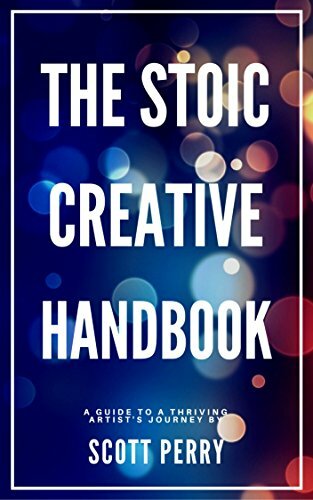 The Stoic Creative delivers lessons and exercises that are straightforward and engaging. It begins with provocative assertions that shift your mindset and reveal possibilities. It provides a clear process for dialing in the purpose of your the work and get you started on it now. It ends with an approach to cultivating a thriving artist's mindset as your journey to excellence continues to unfold beyond this handbook. introduces an easily understood innovative concept. ends with a short exercise or two to help you put the ideas into action. begins with a motivational quote and ends with words of encouragement. Internalizing the concepts and completing the exercises in this handbook promotes less frustration and greater flourishing while you engage with the challenges inherent in any meaningful endeavor. But the journey doesn’t end there. At the end of the handbook is a resource guide and suggestions for further exploration. You’re also invited to join an online community where you can connect with the author and a community of fellow travelers who offer support, encouragement, and feedback. enroll in a process that works? be held accountable for realizing your promise? engage in an effort that serves others? Then click “Buy Now” to get going! You have so much more to contribute (& we need you)!